Using the litter box can be tricky for new amputee cats. Keeping your cat’s amputation incision clean is one of the most common concerns among Tripawd cat parents. Many discuss this important post amputation cat litter box issue in our new “3-Legged Cats” Discussion Forum topic. That’s where you’ll find many tips about how to help your Tripawd cat and today we’d like to add another one. Some cats need more time than others to figure out how to use the litter box after amputation surgery. In their quest to be clean and tidy, many Tripawd cats fall over in the litter box when trying to cover up their business. Extra patience and encouragement and sometimes a few modifications are needed to get a new amputee cat back into the box with ease. Good thing Dr. Elsey’s Senior Cat Litter is available on Amazon. We heard about this great feline product while exhibiting for Tripawds Foundation at the Western Veterinary Conference in Las Vegas. What caught our eye was the Dr. Elsey’s Senior / Post Surgery Cat Litter display. This didn’t look like any other cat litter we’ve seen. 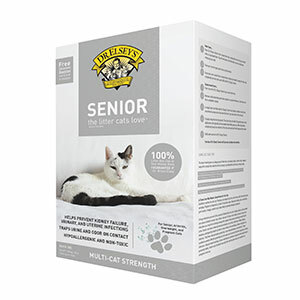 Dr. Elsey’s Senior Litter helps prevent bacterial contamination of the genital area because the litter absorbs urine odor and bacteria on contact, traps it inside the silica crystals, and wicks it away from the cat’s body. It won’t stick to the cat’s long hair and there’s no other formula like it. Why is Senior™ / Post Surgery Litter important to Cat Owners? All Post Surgery cats need a clean, dry, bacteria free litter to heal in. Made with non toxic biodegradable Silica Gel Crystals with natural herbal attractant to bring cats into the litter box. This litter can work well for any cat, but especially those with amputation incisions. Dr. Elsey has been a feline only veterinarian for over 35 years and his practice cares for over 8,000 cats. Nonuse of the litter box is the number one behavioral reason cats are abused, abandoned and placed in shelters. This cat veterinarian’s goal is to provide products that help cats live happier, healthier lives and provide litter box solutions for the life of your cat. He has an entire line of specialty litter that any kitty would be happy to have in their own litter box! Tiffany, thanks for all you do for the Tripawd kitties! I think that because this litter is specifically made for situations where cats need extra TLC against infections, I would go with this one. I liked what we learned about it at the conference. I’m sure the kitties will have the last say but it can’t hurt to give it a try.